It’s been five years since we took a conscious decision to alter our lives drastically, abandon a decent full-time salary and downsize, abroad. Asturias on the north coast of Spain had captured our imagination and hearts when we came here on holiday several years previously. DIY takes on a new meaning. After several bad experiences, DIY has come to stand for “do it yourself as you can probably do it much better than someone else and considerably cheaper”. You learn new skills through trial, error and advice from great neighbours past (Terry and Bob) and present. You begin to realise that small-scale building projects and ongoing maintenance work doesn't necessarily need an estimate nor a shaking of the head that signals this is going to cost. You begin to believe that “actually, I could do that myself”. There is no doubt that this change of direction in our lives has resulted in a complete re-think and re-evaluation of what is important in life. Gone are the days when we sit in traffic jams on our way to work for organisations that are so wrapped up in the politics of managing that they have forgotten what they are there for. Gone are the days when we would spend silly amounts of money on the latest must haves and holidays that were over before they began. Gone are the days where you sit daydreaming and wishing your life away as you cannot wait for the weekend to arrive. La Pasera is surrounded on three sides by fields, cuetos (rocky outcrops and meadows), caves and woodland. We often hear larger mammals scurrying around after dusk, some of which you can identify but others impossible to see or name. 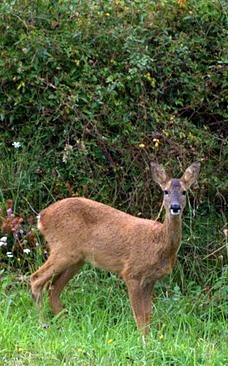 Deer can be often heard, especially the barking of the males, but rarely seen. On occasion we can identify the small herds of wild boar by their rough low pitched growls as they turn over turf looking for bulbs and roots. Rodents of various kinds can be heard gnawing away of fallen nuts with their teeth and hedgehogs can be seen hurrying around looking for slugs, earthworms and beetles, grunting as they work their way around the garden. We have recently seen a beautiful young red squirrel perched in the top of the old cherry tree, brought to our attention by Gawber who sat for ages trying to work out if it was worth the effort of pursuit. Some years ago, we found a young pine marten during daylight hours, in the longer grass near the hut but have not seen once since. For the past few years we have hosted a stall at the annual Rastrillo in the village of Nueva a few kilometers from home. The market is organised by a small committee who raise funds for Doctors without Borders. It takes place on the main street and is very much a mixed bag of stalls and people but never-the-less very enjoyable. We each pay a few Euros per meter of space which is donated to the the charity. Each year we have used the stall to demonstrate chair restoration i.e. cane work and rush seating. Luis usually demonstrates rush and I, the cane. This year Luis' sister Maria Esther wanted to join us to sell her handmade brooches and key rings. Made of felt, leather, beads and other bits and bobs, they are really popular here in Spain at the moment. Her reproductions of animals, symbols, sweets and a host of other designs are really attractive and extremely well made and thought out. With the economy subdued this year we decided to only demonstrate cane seating and not rush, thereby releasing me for the day....only to be on catering duty for the 6 or so relatives and friends who needed feeding. There were about 25 stalls selling: second hand games and toys, clothing, wooden garden furniture, antiques and bric-a-brac, fair trade chocolate, sweets and coffee, painted roof tiles and chairs of course. All in all considering less people and a bit of a drizzly overcast day, they did really well with Luis selling three cane-seated chairs and taking orders for restoration of others and Maria Esther selling about 60 brooches and key rings. It struck me the other day that we rarely talk about the village where we live, Toriello. Having been here nearly 6 years now, we know everyone to one degree or another and often pass the time of day with each other as our paths cross. Toriello has a permanent residency of around 50 people and an influx of visitors in summer, spending time in their holiday homes or visiting family. The village is a collection of houses that are spread over a fairly wide area and at its centre lies a small village chapel, an old school house (no longer used as a school) and a small village square that is actually triangular. The main north coast narrow gauge railway passes through the centre of the village with small rural trains every couple of hours, a steel train bound for Aviles once a day and the weekly passing through of the Trans Cantabrico, a tourist train that takes it's occupants on a very luxurious journey through the delights of northern Spain. Sited about 1 km from the coast and the Bay of Biscay, we can trek along one of many cattle routes and small caminos to the cliffs and the impressive limestone blow holes that litter the coast line. Being on the direct route of the Camino de Santiago, we see many back packer pilgrims making their way along the northern coastal route through Asturias, to Galicia. Stopping of at the village fountain to refresh their water bottles and take a short break before they set off for Ribadesella for an overnight stay. Invariably when we meet pilgrims on the path, they enquire how long it will take to reach Ribadesella. Luis always adds on 15 minutes or so in the belief that when they reach town earlier than expected, they will be pleased with their progress and it will brighten their day. The majority of residents of Toriello are Asturian born and bred and many have not travelled widely however, we do have a healthy population of incomers from Germany, France, Italy, Ireland, UK and other parts of Spain, a few of whom are permanent residents. Although the Spanish don't neighbour in the same way as we used to in the UK, they do often spontaneously gather on the corner of the lane, outside one of their homes or at the edge of a vegetable plot and discuss the news of the day, the weather, the harvests and the local gossip, nothing malicious, just catching up on each other and enquiring after old friends and neighbours they may not have seen for a while. A few people in the village make their own cider from the abundant apple orchards that surround the village. Invariably, if we stop for a catch up, the chilled cider comes out and is distributed by the host in a single glass, in turn. - a gesture of sharing. The cider is a still cider and is traditionally poured from above head height to oxygenate it before drinking - only 50 mls or so are taken at a time and then the glass is returned for the next one in line. It's strong, especially when drunk during the day....needless to say, we try and make sure that we bump into people on the way back, rather than on the way out to our daily walk. Being vegetarian most of my life, there are numerous stories that illustrate the problems associated with not eating meat or fish in a world where meat and fish dominates people's daily food. Having travelled extensively in the past it now seems quite strange that I choose to settle in the one country where being vegetarian is akin to being an alien. Me: I am vegetarian, I do not eat meat or fish, what can you serve me? Waiter: We have lovely liver. Me: No meat, fish or offal. Waiter: We have seafood, lovely seafood. Me: No meat, fish, offal or seafood. Waiter: Ah, we have vegetable soup. Me: Does it have ham or a ham bone in it? Me: Can you do scrambled eggs? Waiter: Yes but they have sea urchin eggs in. Me: Can you ask if they can do the eggs without sea urchin eggs? Some restaurants in the past have refused to cook anything other than what appears in the menu whilst others offer a simple egg dish or plain salad. In the majority of cases, the one life saver that can always be relied upon for sustenance is Tortilla - even then you have to be careful that it is a plain tortilla and not cooked with chorizo, ham or tuna fish. Here is our recipe for a life saving Tortilla. Peel and dice enough potato to fill a non-stick frying pan, add one finely chopped onion. Sauté in olive oil until the potato and onion is cooked and slightly browned and caramalised. A lid can be used to speed up the frying and reduce the amount of oil used. Season with salt. Meanwhile, whisk about 6 eggs (for an average sized frying pan) and add any herbs you fancy. Thyme or sage work well but are not traditionally used. Add the cooked potato and onion to the egg mixture and mix carefully - a thickish creamy consistency is required. Add a touch more oil to the pan, bring to heat then add the mixture to the pan. Cook for several minutes until browned and partially set (steam vents come out of the mixture). Turning at this stage can be problematic but here in Spain we use a special plate with a handle on but a dinner plate could be used if need be. Put the plate on the tortilla over the pan, lift and quickly turn the pan and plate. Add a touch more oil to the pan and bring to heat, carefully slide the tortilla back into the pan until cooked to taste. Remove from the pan by turning with the plate and pan again, leave to cool and serve with fresh salad. A life saver! At the end of the course the participants will have woven a seat using rattan cane. Al final del cursillo, los participantes habrán aprendido la tecnica basica para tejer artesanalmente la rejilla usando junquillo o tireta de rattán.